There are several coastal and island communities in India and around the world with intermittent or no access to electricity. While solar energy can help electrify these locations, acquiring large tracts of land on which to base a plant in these regions is problematic and expensive, especially considering the growing population. However, these coastal regions do have one resource in abundance – the sea. Floating solar power installations on lakes has been gaining popularity over the last few years, but there has been no system capable of laying a solar power plant over the ocean. Sea6 Energy has created eco-friendly floating islands called Dweeps, which are modular, scalable and designed to survive the harsh marine environment. 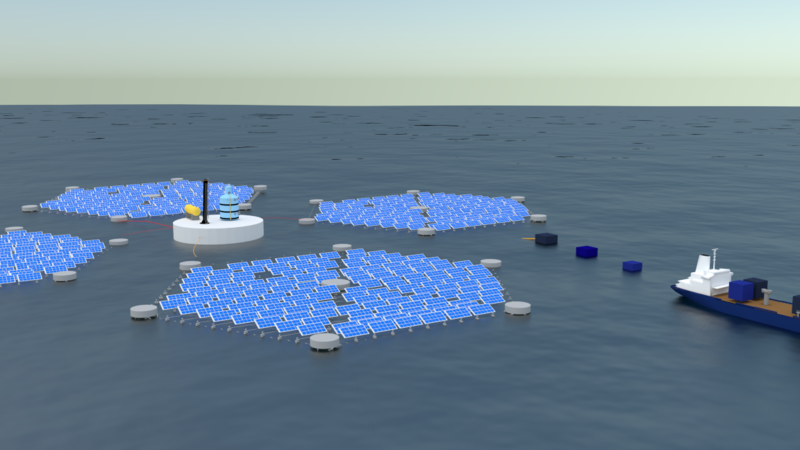 The Dweeps make use of the plentiful ocean surface to provide a novel way of deploying existing technology to generate solar energy. This power can also be used to generate fresh water through desalination plants, generating the maximum amount of fresh water in the hot summers when the sun is most plentiful and when water is most needed. The Dweeps are able to withstand poor weather conditions by making use of a concept found ubiquitously in nature – tensegrity – to flex to the changing surface of the ocean rather than resisting it. Using a combination of pre-stressed cables and struts, it is able to mimic the flexibility seen in the human body with bones and tendons. An added advantage of this system is that the flexible nature allows the structure to absorb the wave energy, acting as a natural breakwater to reduce coastal erosion by waves. A prototype unit has been installed off the coast of Tamil Nadu, where the results have been extremely promising. As a next step, there are plans to deploy a system capable of generating at least 100 kW of power to demonstrate the potential of the system. The size of the islands can vary based on their application, ranging from a few square metres to several hectares. These solar powered islands can also serve as autonomous research stations in the middle of the sea, capable of collecting valuable oceanographic data throughout the year.